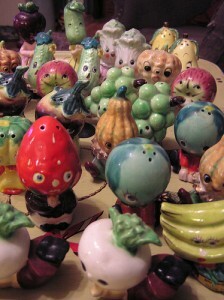 We hear from many folks interested in Salt & Pepper Shakers that are wanting to start a collection or add to a current collection; their questions range from “What is the appeal of collecting Salt & Pepper Shakers” to “What are Anthropomorphic Salt & Pepper Shakers” to “How do you know its Vintage” so we thought there just might be more folks out there with the same interest and questions and we hope this little guide will provide a bit of insight into this delightful collectibles arena for you. Salt and Pepper Shaker collecting took off in the 1940s with the creation of ceramics. Salt and Pepper Shakers were being made in a variety of designs, shapes, and themes. Souvenir shakers were especially popular during this time frame and were affordably manufactured and therefore affordable to purchase. Today, shakers come in a variety of materials from glass, to wood, to metal to anything imaginable. Folks collect Salt and Pepper Shakers for many reasons. 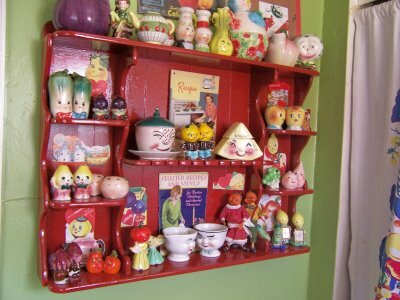 Some inherit an existing collection, others might focus their collecting on a particular theme or manufacturer, and yet others feel a connection with their vintage shakers to a bygone era, shakers are small and easy to display, and Salt and Pepper Shakers do increase in value as particular ones become harder and harder to obtain and are highly sough after. Obviously there are many reasons why folks collect, but, the main reason is that it brings people JOY. 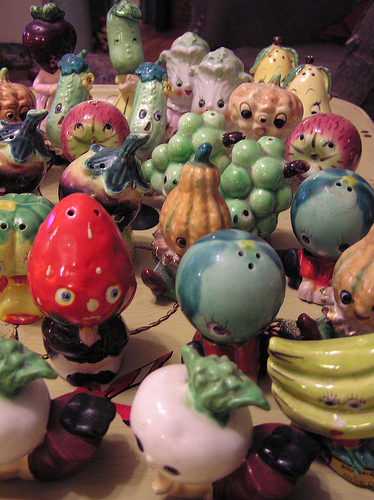 Anthropomorphic Salt and Pepper Shakers are shakers given uniquely human characteristics and expressions, are usually very colorful and animated – kind of like cartoon characters. Anthropomorphic Salt and Pepper Shakers can be depicted to resemble Banana Heads, Spoon & Fork people, Corn Stalk people, Cucumbers Heads, Garlic Heads, Egg People, Fish people, Dogs, Cats, Birds, Tomato Heads, Pumpkin Heads, Sunflower Heads, Novelty Shakers, etc…. 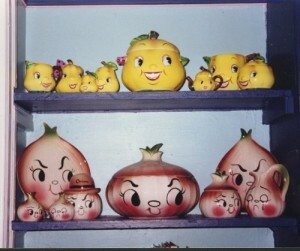 Anthropomorphic shakers are a REALLY fun type of shaker to collect and most are vintage dating at least 50 years old and have cork stoppers and are most likely Made in Japan. The term “Vintage” references items from the1920s -1980s and typically anything at least 50 years old can be considered Vintage. An Antique on the other hand should be at least 100 or more years old to be classified as an Antique. Items stamped or marked “Made in Japan” were typically made prior to the First World War and after the Second World War as Japan was much like China and Taiwan are today; countries where items can be cheaply manufactured and mass produced. The term “Made in Occupied Japan” refers to the period in history right after the Second World War when the United States, Australia, British India, United Kingdom and New Zealand were involved in re-building Japan and were a main presence. In 1951 a peace treaty was signed that was enforced in the spring of 1952 when Japan became an independent state again. Items produced in Japan during this short time frame are stamped/marked “Made In Occupied Japan” and considered more desirable and valuable by many collectors. Many of the Vintage Salt and Pepper Shakers we sell are from these eras and are fun to collect as they have an appealing charm about them that comes across in the way they were molded and painted. The appeal of collecting Salt and Pepper Shakers fills many books, homes and cabinets across the world and we hope you found this little guide helpful in providing a glimpse into the arena of Salt and Pepper Shakers. Are you ready to be a collector yet?